Hubert Humphrey was known as the Happy Warrior for his cheerful approach to the political wars. In contrast, Fox & Friends Weekend's Julian Phillips, judging by his crabbiness this morning, might be dubbed the Whining Warrior. Beyond his rain-on-the-parade words, Phillips' body language and facial expressions oozed negativity. The shot to the right is a file photo, but typifies Julian's less-than-sunny demeanor. It was the MSM's worst nightmare-in-the-making: the prospect of a day, maybe more, of nothing but jubilant Iraqis waving those damn purple fingers, some of them no doubt soppily shouting "thank you, Mr. Bush!" Ugh. Can't let that happen. Don't worry, MSM: the New York Times, with a nice assist from the Washington Post, have got your back. So when do the Times and the WaPo choose to break it? 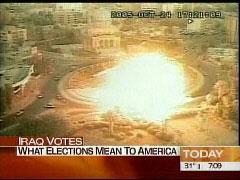 Why, today of course, just in time to rain on the Iraqi election good-news parade. 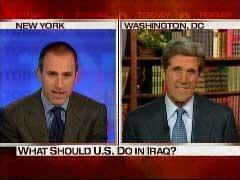 Matt's Dreamin' of a Wide Withdrawal; Iraq Elections Lead to Unfriendly Government? While sugarplum fairies dance in other heads, Matt Lauer dreams of US withdrawal from Iraq and envisions democracy in Iraq as having negative consequences for the United States. As reported here, Lauer set the stage earlier this week, couching Today's coverage of the then-impending Iraqi elections largely in terms of their potential for troop withdrawal. "We recognize the right of all women to choose whether, when, and under what circumstances to bear children. Reproductive freedom and responsibility are essential to other rights and opportunities, including pursuit of education, employment, financial security and a stable and fulfilling family life. Restrictions of reproductive choice are especially burdensome for young women and poor women. Girls Incorporated supports a woman’s freedom of choice, a constitutional right established by the U.S.
Judging from this article by SF Chronicle staff writer Leslie Fulbright, which Drudge posted, perhaps Tookie Williams should have been canonized and supporters of the death penalty punished in his stead. The headline set the tone: "Tears, anger, silence at protesters' candlelight vigil; Speakers read from Williams' anti-gang children's books." Allies Establish Beachhead in Normandy: Can Troop Withdrawals Begin? Somehow, I doubt that was the headline in the wake of D-Day. 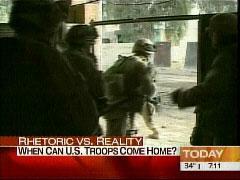 Yet this morning, the Today show viewed the impending Iraqi elections largely through the prism of bringing US troops home. AP's Schweid Finds Strict U.S. Rules on Interrogation "Reassuring"
In a TV-journalism age in which a good haircut and a sharp suit often seem to count for more than substance, there's something admirably old-school about Barry Schweid. Old, and unapologetically schlumpy, Schweid is the antithesis of TV's Sharp-Dressed Man. Even so, on Fox & Friends Weekend this morning, Schweid let his liberal leanings show. "The issue for me is, is he guilty or is he not? He still maintains his innocence. If they can prove through DNA and other stuff, fine." 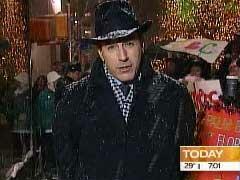 Keffiyeh-gate: Was Matt Lauer Wearing a 'Palestinian Support Scarf' this Morning? Was Matt Lauer wearing a Palestinian support scarf this morning? Alright, I can already hear some folks out there chuckling at the notion. Has Katie Couric watched too many westerns? You know, the kind where the sheriff shoots the gun out of the bad guy's hand? You'd think so, given the repeated questions she posed to a former air marshal in the wake of yesterday's shooting of a frantic passenger claiming to have a bomb aboard an American Airlines flight . 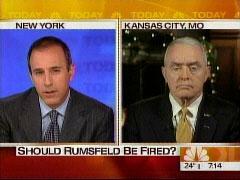 Lauer & McCaffrey: Bring Us the Head of Donald Rumsfeld! The forces of NBC, in the persons of Matt Lauer and Barry McCaffrey, launched a major attack on the enemy this morning. No, not on Al-Qaida or the Baathist dead-enders. We're talking of a real MSM enemy: Donald Rumsfeld. Perhaps Katie Couric was only playing the reporter's role of devil's advocate, but one sensed she was speaking her own mind in interviewing Dem Rep. John Murtha on this morning's Today show. And just what was on Katie's mind? 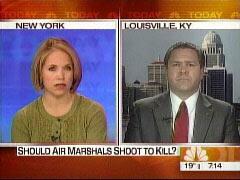 That Iraq would dissolve into chaos and terror were the US to beat the kind of hasty retreat that Murtha advocates. Quick! Someone buy the man a Valium. Make it a double. I'm sure most here remember the histrionics in which Shep Smith engaged while reporting from New Orleans in the aftermath of Katrina. Smith was back in high emotional pitch today, shouting, screaming and accusing the government for its shortcomings as detailed in the just-released 9/11 Commission 'report card' on implementation of its national security recommendations. The truce is over. It's war again. Puerile Pinch-Hitter: Henican Enough to Make One Long for Short Ellen Ratner? Readers of my NewsBusters entries know that Ellen Ratner, the short end of the "Long & Short of It" feature at Fox & Friends Weekend, has been a frequent object of my ire, as seen here, here and here. It's thus saying a mouthful that the puerile performance of pinch-hitter Ellis Henican this morning was almost enough to make one long for the short Ratner. Almost. Henican took on fellow Newsday columnist Jim Pinkerton, who normally locks horns with Ratner in the segment. I kept waiting for some stern guy from the ACLU to show up. Maybe a Multi-Cultural Sensitivity Trainer from a nearby college. But, lo and behold, I waited in vain, as the Today show aired a segment this morning on the Christmas Tree controversy sweeping the nation that was strongly . . . pro-Christmas Tree! To judge by his treatment at the hands of Matt Lauer this morning, John Kerry: Part Deux teeters on the brink of being dismissed as farce even by his quondam comrades in the MSM. O'Reilly on Fire on Today on Iraq: "It's World War III"
The main subject was President Bush's scheduled speech today to discuss his Iraq strategy. Katie Couric described the impending speech as "very important" and asked O'Reilly what people need to hear from it. O'Reilly got matters off to an unexpected start by declaring: "I'm not even going to listen to the speech. Maybe that shocks people, but [the speech] really doesn't mean anything." Give me a moment, please. Got to let my head stop spinning. Been watching the Today show. See, I thought we all agreed it was bad for presidents to be poll-driven, in the image of a Bill Clinton deciding everything from foreign policy to vacation destinations based on the latest shift in public opinion. Turns out I was wrong, at least according to this morning's Today. 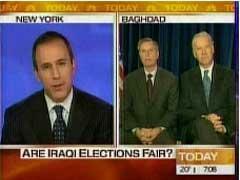 Anyone who believes the Bush administration could appease the MSM and their political allies on the left via a major troop withdrawal from Iraq need look no further than this morning's Today show to be disabused of the notion. Shades of Bush Sr.'s "read my lips" debacle, in which the very same Democrats who wheedled him into raising taxes turned immediately around and condemned him for breaking his promise. 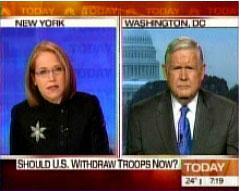 For there was Katie Couric, questioning the wisdom of withdrawal and painting a bleak picture of a post-withdrawal Iraq.